Following the fall of Tobruk in May 1942, the Commonwealth forces in the desert struggled to reach the last real defensive position before Alexandria and halt what seemed to be an unstoppable Afrika Korps. In a series of battles stretching from June to November 1942, they first stopped the Axis offensive and then began one of their own that shattered Erwin Rommel’s legend of invincibility and drove the Germans and Italians out of Africa. Designer Brian L. Knipple’s masterpiece is one of the largest games we’ve ever made, with four oversized maps divided into hexagons at a scale of two kilometers across each hex. Some scenarios use only one or two maps, allowing players to wage war in an afternoon or set it all up and play all weekend. The game system is the most involved we’ve published, the same as that in Island of Death and in some of our earlier games that are now out of print like Red Steel and Red Parachutes. Each day is divided into four game turns. At the beginning of each day, players receive reinforcements and artillery ammunition. Players then alternate turns conducting movement, bombardments and attacks. Units that achieved breakthroughs during combat have the chance to attack again if their formation leader successfully activates them. Units are grouped in formations — divisions and some brigades. Players make most of their decisions based on what they want these formations to do, and then move the battalions that make up the formation to execute it. Formation identification is important for assigning artillery support, executing breakthroughs, and many other game functions. Each unit’s formation affiliation is indicated by the historically-accurate symbol in the upper left corner of the playing piece (several Italian divisions have their provincial flag instead, as Italian infantry division badges were very plain). Artillery units are rated for offensive and defensive support. Each artillery unit has a corresponding support marker that’s placed on its target hex. These can be used twice before the unit’s ammunition supply must be replenished. The Allies over time have a much greater supply of artillery ammunition, allowing them to use their artillery much more freely than the Axis. New to this system is a game-within-a-game for air combat. Every air squadron that participated in the campaign is present, rated for air-to-air combat (attack and defense) and bombing strength. Players assign squadrons to missions, and if they obtain air superiority can do great damage to the other side’s supply infrastructure — a key concern of the Axis player, who is badly outnumbered in the air. 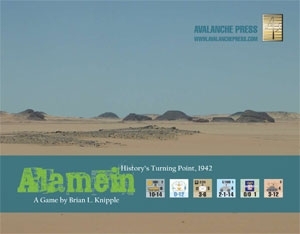 Scenarios include the Australian and South African spoiling attack in mid-July, the late June battle for the Mersa Matruh position where slow response almost cost the Commonwealth the bulk of the New Zealand Division, the first Axis attack on the Alamein line in early July, the last Axis attack to break the Allied line at Alam el Halfa at the end of August, Operation LIGHTFOOT: the Eighth Army’s attack against the Axis line in late October and the massive campaign from the end of June to the beginning of November 1942.